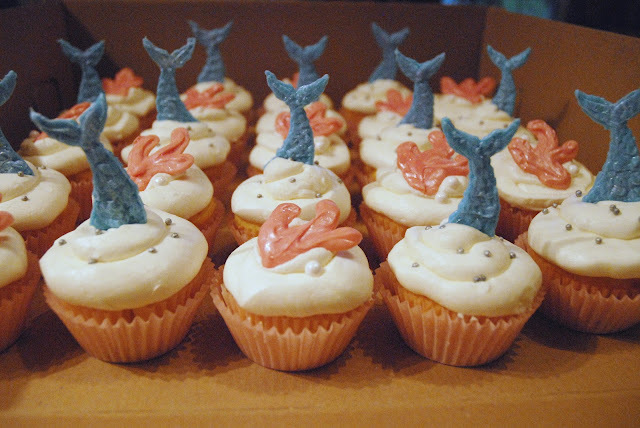 I got an order for mermaid tail and coral cupcakes for a mermaid themed birthday. 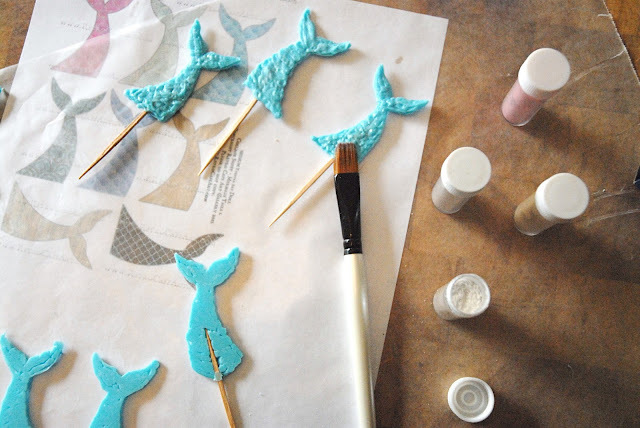 I had never made mermaid tails before and I wasn't sure how I was going to do it. My first thought was to make the tails from a chocolate mold, but that's not something you can find very easily in short notice. I knew I needed to free hand the designs and I needed to decide what I was going to use to make them. 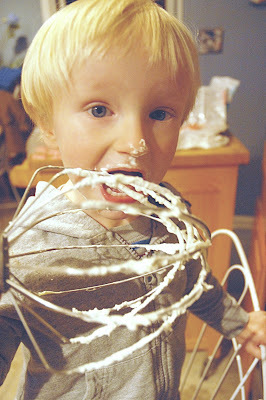 I first thought about using fondant but decided against it for many reasons. 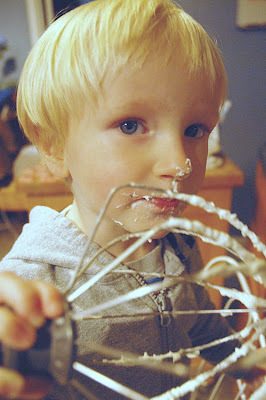 First, fondant has the tendency to droop unless you let it dry or use gum paste, which will harden completely when dry. But who wants to eat dried out fondant or rock hard gum paste? I settled on candy melts because they are easy to use, come pre-colored, and taste pretty good. I started by finding a usable pattern from Google images and printing it out. 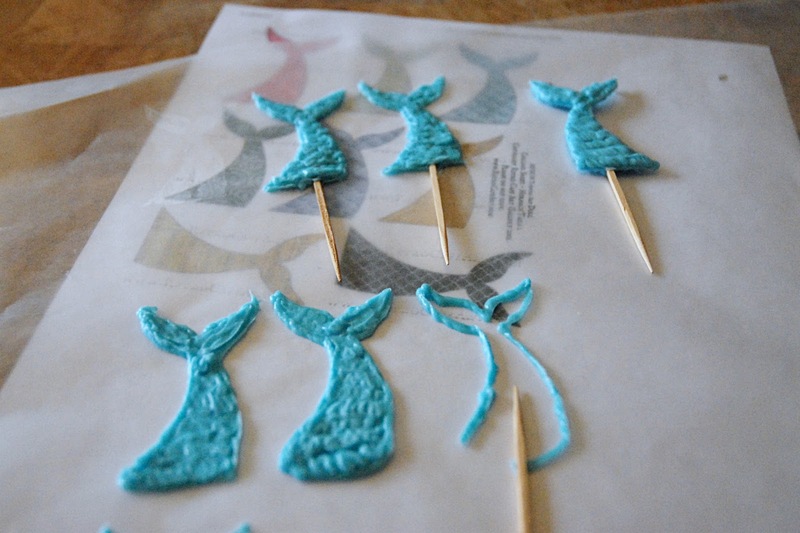 I ended up using a sheet of printable mermaid tail bookmarks. 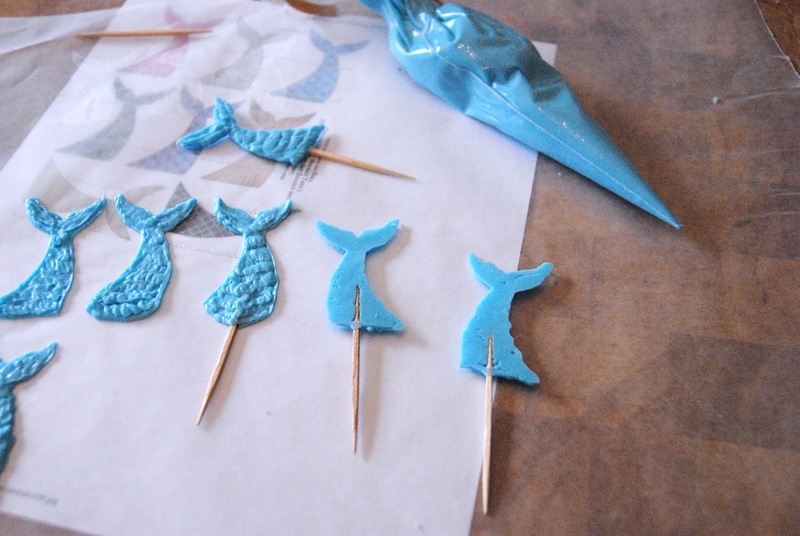 I placed my pattern under a sheet of wax paper and then piped outlines of each tail, placed a toothpick in the center, and then filled in the outline in a squiggly pattern to form scales. Once it had hardened, I carefully flipped each tail and filled in the other side to create a 3D tail with a toothpick coming out the bottom. 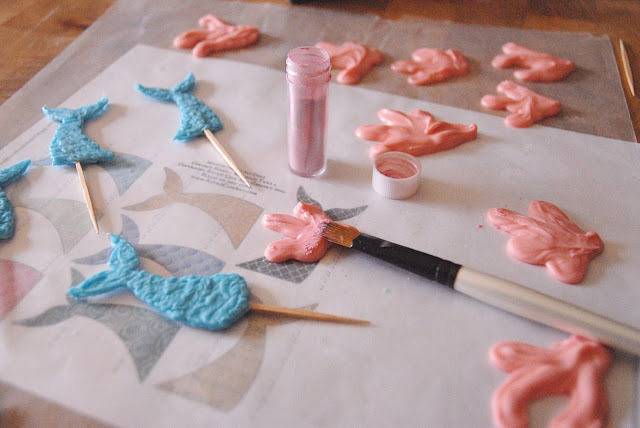 For the coral, I simply piped out coral shapes onto wax paper and let them set. 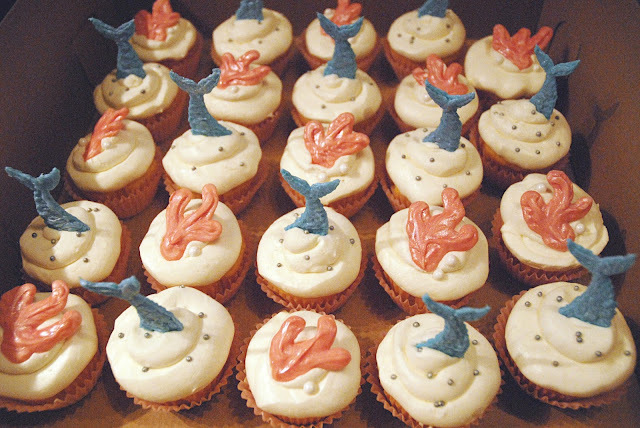 I finished both the mermaid tails and coral by painting them with luster dust to give them a sparkly shine. After placing a piece on each cupcake, I finished by adding silver and white pearls. My nephew, Daniel, helped me sprinkle the pearls on top. 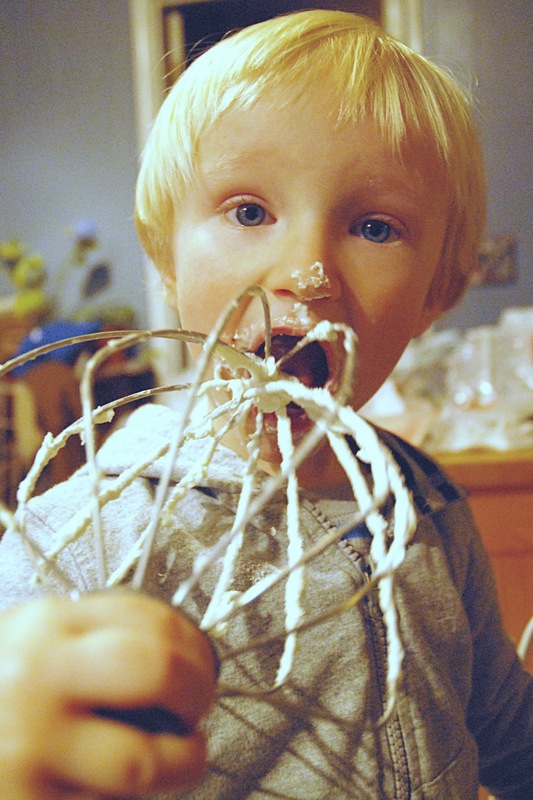 I had to keep a very close eye on him because he thought the cupcakes where for him and was very upset when I told him they were for a little girl. 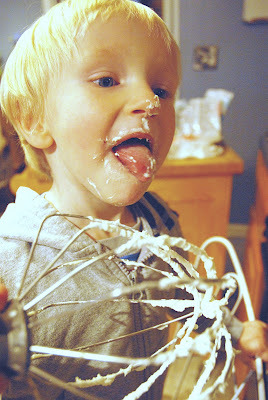 In the end, he was satisfactorily rewarded with a beater full of icing to lick. These are lovely! Really great idea for making the tails!